As per the findings by a recent study by Transparency Market Research (TMR), the global automotive intake manifold market is highly fragmented with the presence of a number of large and small players. The study identifies Magneti Marelli S.p.A., Mann+Hummel Group, Aisin Seiki Co., Ltd., Röchling Group, and MAHLE GmbH as some of the key players in this market, with research and development of innovative products as the common strategy to gain ground over the competition. In addition to that, in order to expand their geographical reach, several leading players indulge in collaborations with regional players. According to the estimations provided in the report, the global automotive intake manifolds market will be worth US$58.7 bn by 2024, incrementing at a CAGR of 3.6% during the forecast period of 2016 to 2024, from a valuation of US$42.7 bn in 2015. The report detects that consolidating relationship with consumers, automotive OEMs, and aftermarket suppliers is another area of focus for the manufacturers in the global automotive intake manifold market, which helps them to expand their market presence in the target geographical areas. As far as product offerings is concerned, perennial R&D in product design in order to achieve low-cost, economically advanced, and compact engine assemblies is expected to determine the leading of the market in the near future. All of the notable players also promote and market their new prototypes at platforms such as official presentations and auto expo fairs. Based on material type, the TMR report segments the global automotive intake manifold market into aluminum, plastic, and other composites. Among these, aluminum continues to contribute the maximum share of demand, owing to remarkable properties aluminum such as lightweight and resistance against rust. 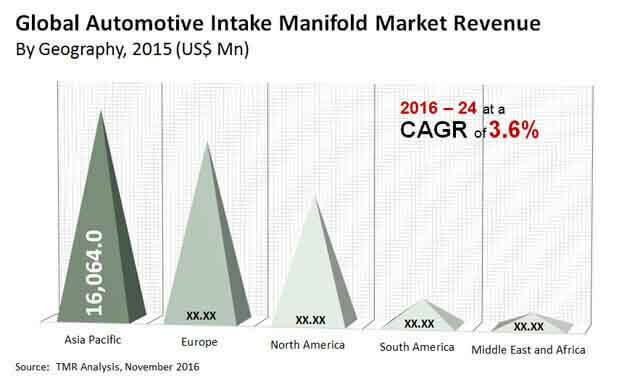 The report expects the demand for aluminum intake manifold to increment at a CAGR of 3.3% during the forecast period of 2016 to 2024. Besides that, the segment of composites are projected for the most robust growth rate. On the basis of vehicle type, the report categorizes the market into light commercial vehicles, heavy commercial vehicles, and passenger cars. With increasing disposable income and rapid urbanization, the demand for passenger vehicles is skyrocketing and proving to be a boon for this segment. Geographically, the report studies the opportunities available for the players in the global automotive intake manifold market in the regions of North America, South America, the Middle East and Africa, Asia Pacific, and Europe. Asia Pacific, with vast population base, is currently the most lucrative region in the automotive intake manifold market. The prosperity of the automotive sector is quite evident on the global automotive intake manifold market, wherein the manufacturers are striving to reduce the weight of vehicles to achieve higher fuel economy. Several governments across the world are urging manufacturers to adopt light components, for which aluminum is the most preferred choice, though plastics are also gaining popularity for the production processes. Increasing disposable income among vastly populated countries such as India and China and improving living standards are some of the other factors favoring the global automotive intake manifold market. On the other hand, fluctuations in the prices of raw materials is hindering the growth rate of the global automotive intake manifold market. Moreover, significantly lower product replacement rate, significant overhead costs, volatile currency exchange rates, and reduced margin in order to meet the competitive pricing are some of the other factors challenging the market from achieving its true potential.